Welcome to another edition of Make It Monday! Today I am going to share with you how to create a "floating image" and a shaped window to adhere it to. It is so easy, yet the results are so fun and unique! Enjoy the video! Here are some still shots of today's project! –Create a project utilizing your take on the challenge. Your project must use at least one Papertrey product and a floating image within a shaped window. –You will have until 7am, Monday, November 5th, to add your link to the list to be eligible to win. And you can enter as many times as you like. –One randomly selected winner will be chosen from ALL the entries on Monday, November 5th, after 7am. The winner will be posted here on this blog post, on Twitter and Facebook. The randomly selected winner will get a $25 PTI gift certificate to spend however they like! Congratulations to Jill Norwood for being randomly selected as this weeks winner! Please email Customer Service and provide the email address you would like your $25 gift certificate sent to! And a big thank you to everyone else who participated in this challenge. There were so many amazing entries! Enjoy the rest of your week! This is a gorgeous technique! Thanks for showing the step by step process. I will be trying this FOR SURE! 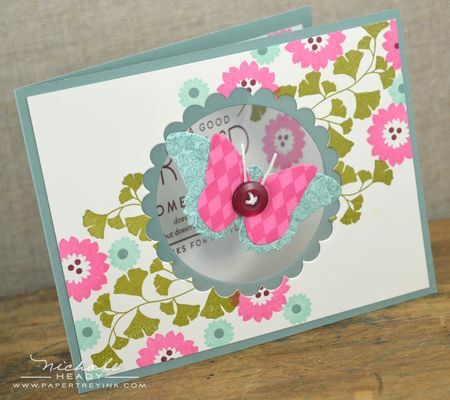 Beautiful card, inside & out~lovely technique Nichole! I have to say I was captured by the floating technique but not real wowed by the colors…until I watched you put it all together. Now I think it all works so perfectly!! Gorgeous! I love to watch you work/play! Gorgeous card and I really appreciate your calmness as you put it all together. Serenity now! Beautiful card. This is the first time I watched one of your videos – very well done. Can’t wait to watch more! Loved this tutorial. I’m definitely going to have to try this!! Thanks so much. What a beautiful card! I enjoyed watching this technique on this raining day! Nichole, you make it look easy, can’t wait to give it a try. Monday’s are my new favorite day of the week! A lovely card whose technique I will use! Thanks for sharing. Great tutorial, beautiful card! Thanks for sharing both! What a beautiful card! Great tutorial too! This is a simply beautiful card. I do have a comment to make about the video. I have a great deal of trouble hearing Nicole when she presents a video. I don’t seem to have that problem with the other designers. This hopefully will be taken as a little constructive criticism. Bautiful!! 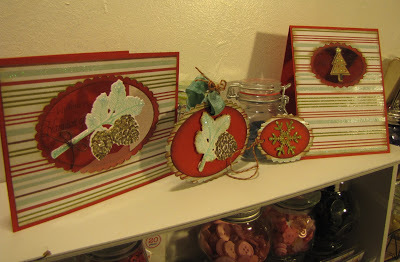 I can think of ways to use this tutorial on my own cards.Thanks so much for an excellent demonstration. An absolutely beautiful card! I can’t wait to try this myself! Thank you! 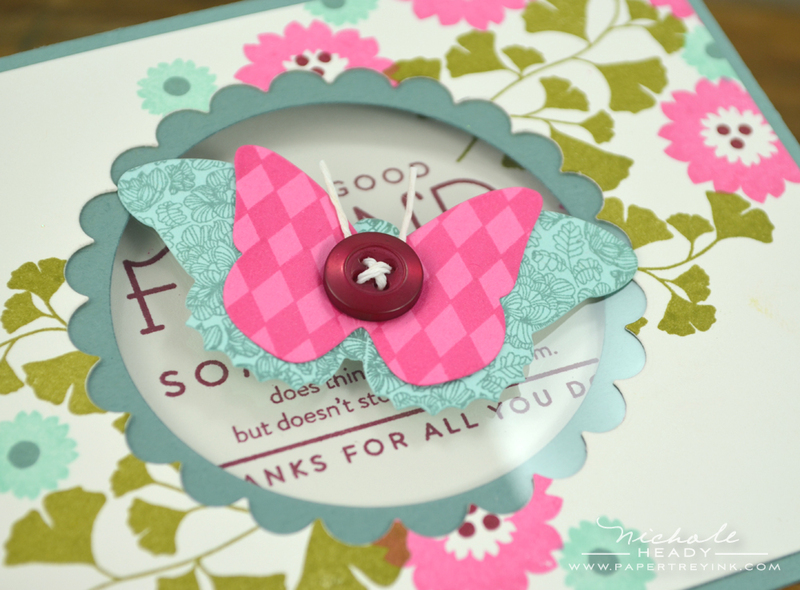 A lovely card and great tutorial, thanks for sharing, now off to my craft table to see what I can do! This is the BEST card I’ve seen so far and absolutely love the technique. Thanks for sharing NIchole. 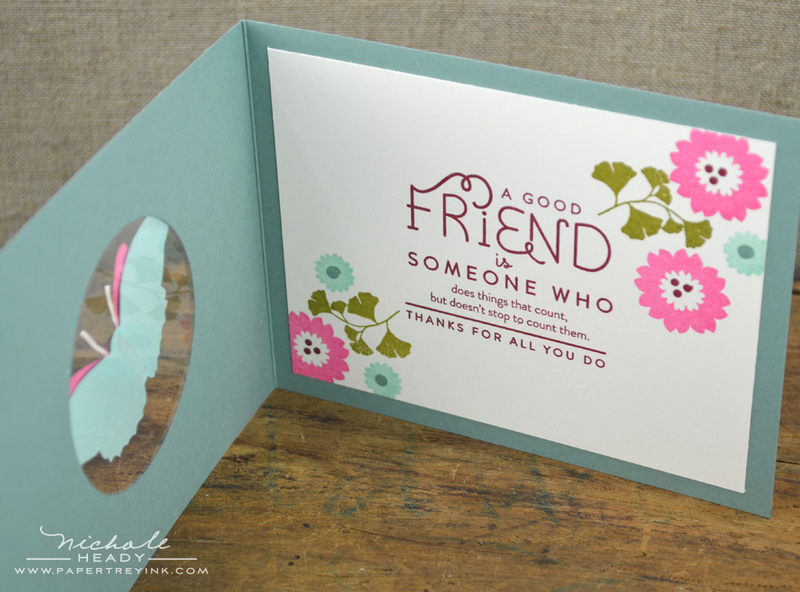 This is a lovely and simple card – just what you do best! Thanks Nicole for the inspiration! thanks for the tutorial…lovely card. I was just wondering if anyone could tell me where I could buy clear cardstock!? I love the card, thanks for the inspiration! I find myself coming back every month. I love your stamps and all the projects! Love your card and appreciate you taking the time to show us how you did this. I still love this card!!! I have made it in the past and gave them all away and had to search to find your Make it Monday again so was happy to find it. This is such a fun technique and Harvest Berries is still one of my favorite stamp sets!